Chicago is one of the most historic cities in America, a staple of both midwestern values and big city culture on the sparkling vistas of Lake Michigan. It is also the third-most populated city behind New York and Los Angeles, so the Windy City is much more than just the Cubs and the White Sox and the Bears and the Blackhawks. It’s a place to be a part of the scene one night, and then retreat to a lakeside cabin the next. Below, we named just a few of Chicago’s attractions, all of which are in either walking distance or short drive distance of our cheap downtown chicago hotel. Navy Pier (1.4 miles) – Chicago’s famous Navy Pier is a 102-year-old landmark located in Lake Michigan. More than just life-changing views offered by a location surrounded by water on three sides, the pier has become a hub of family activities and nightlife expeditions over the decades. There are too many attractions to name—sightseeing tours, seafood restaurants, amusement parks, atriums, boat tours, museums, and even a ferris wheel—but there is little chance of being bored on family outings, romantic getaways, or going solo. Millennium Park (1.5 miles) – An award-winning marvel of modern “green design”, the park is a free-admission locale that hosts everything from outdoor movie screenings to concerts to the city’s official Christmas tree lighting. It’s difficult to pick one of the civic center’s attractions as the most alluring, but it is perhaps most famous for Cloud Gate, the centerpiece of the AT&T plaza. House of Blues (0.5 miles) – Blues and jazz music are as much a part of Chicago’s history as its many towering skyscrapers, and the House of Blues is as good a place to hear acts both world-famous and local. The kicker is that it’s more than just a place to hear live music, but an eatery that boasts both high-end delicacies and hometown favorites, all just half a mile’s walking distance from the hotel. TheMart (0.3 miles) – Formerly called the Merchandise Mart, this is a building taken straight from the noir scenery of old films, with scale and architecture that is breathtaking by day and even more spectacular by night. Inside, you’ll find a weekend’s worth of designer showrooms, boutiques, and furnishing centers to get lost in, as well as trade shows with exclusive merchandise that areNew open to the public. New City (2.0 miles) – There are plenty of shopping malls in Chicago, but New City is something more. It is a sprawling, modern “lifestyle and entertainment” district that showcases the city’s millennial capabilities while staying true to its vibe. Its ArcLight Cinemas movie theater on the north side with countless eateries, shops, and entertainment venues throughout as well as free parking. As a bonus, a drive or cab ride from the Ohio House Motel to New City crosses the Chicago River and the North Branch Canal in three places, adding sightseeing trips both to and from the destination. 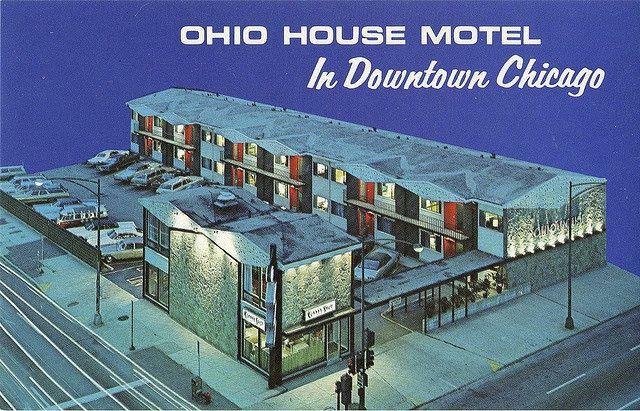 The Ohio House Motel is an affordable stay in the center of the Windy City, granting you access to all the attractions listed above. More than just a place to put your bags, though, the hotel offers breathtaking views of the city from most of its rooms. It’s an ideal stay for individuals, couples, or families looking for a clean, safe, environment with all the modern amenities, but without the overpriced stays offered at other hotels.